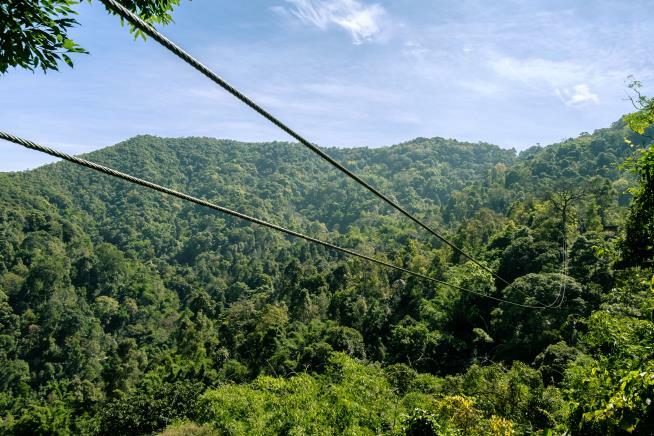 (Newser) – A zipline cable snapped on a course in northern Thailand on Saturday, sending a Canadian tourist to his death. The 25-year-old, who was vacationing with his girlfriend and friends, fell more than 300 feet, authorities in Chiang Mai say, per the BBC. The attraction, Flight of the Gibbon, has been shut down for a police investigation. It also was shut for a time in 2016 after three Israeli tourists survived a collision and fall. Is this the reason why they make you pay first? First line of the Newser article: "A zipline cable snapped on a course in northern Thailand on Saturday, sending a Canadian tourist to his death." From BBC link in the article: "Thai authorities are investigating several issues, including whether the weight limit was exceeded and any potential negligence on the part of the operators."